PARLEM is a web app that connects people from different sides of the political spectrum and gets them to have a conversation they wouldn’t normally be having. Considering the level of political polarisation in Catalonia at the moment, when the activists and concerned Catalonian citizens approached us with this idea, we agreed that it could not be coming at a more appropriate time. Our processes allowed us to be fast and nimble and thus offer the first, and catalytic grant for this endeavour, so that it can be put into action and start bridging the communication divide in Catalonia and Spain at large. On 27 October 2017, the pro-independence majority in the Catalan parliament voted in favour of a unilateral declaration of independence, mere hours before the Spanish Senate voted to invoke Article 155 of the Spanish Constitution (Article 155, allows Spain and the national leadership, to seize back some powers from Catalonia. It is a very powerful legislative tool that had never been used before). After the invocation of Article 155, Spanish Prime Minister Mariano Rajoy sacked the Catalan government and dissolved the Parliament, calling a regional election for 21 December. The PARLEM team having seen this app work wonders in facilitating conversations that would not normally happen in both the Netherlands and Germany, has quickly set up their own Catalonia/España version you can find more information about here. Video is 24 images (frames) per second, so if one image is a thousand words then this 1minute 47second video amounts to approximately 2,568,000 words. PARLEM filmed various concerned citizens openly discussing issues that are keeping them up at night. “create a diverse space, outside of political parties, to talk openly about everything, always defending coexistence and democracy”. The premise is simple. You open the app, and you are greeted with, ‘¡Empieza una conversación!’ (Start a Conversation!) that’s why you opened it after all. You then have to answer two simple questions and start a private and anonymous conversation with a person with an opinion different from yours. 1. With which of the following options do you identify with the most? 2. Do you live inside or outside of Catalonia? You also are given the option to include your name or alias and give a brief 140 character description of yourself should you so chose, listing your age, hometown, hobbies, anything you think might be useful for your interlocutor or that you’d like to share. Regarding privacy, it is important to note that conversation data is not recorded, and nobody (not even Parlem_Cat) can have access to private conversations between two users. These conversations are then deleted one hour after the end of the chat. In addition, no data is saved from the user: the only data of the connection used is the IP, used to block users in case of abuse. The app/platform is anonymous so people trust it. Being user-friendly, well-made, randomised and one-on-one makes people more likely to engage with it. A citizen platform arose spontaneously in Madrid, that called for mass mobilisation in favor of dialogue between the Government of Catalonia and the Government of Spain on October 7th. It started in Madrid but many people joined in from Catalonia and a ‘Let’s Talk’ group is now active Catalonia, fueling the PARLEM initiative. 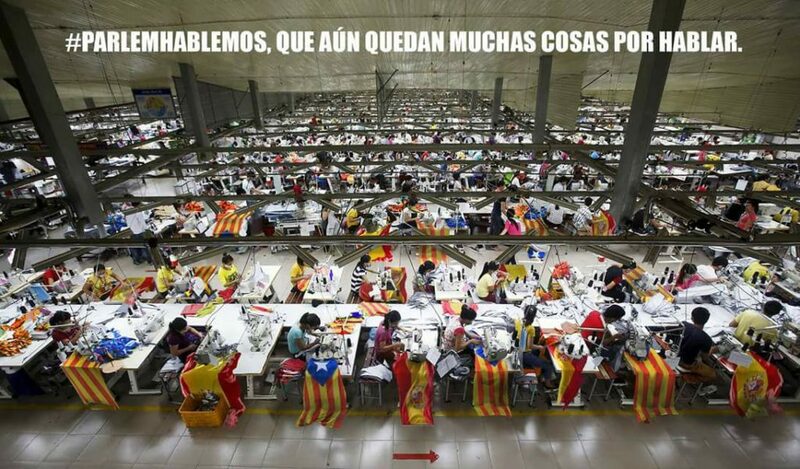 The social media presence of the #ParlemHablemos Movement has been focusing on fun, playful and evocative images and infographics in order to break down boundaries and get people of Spain, Catalonia, and anybody interested in talking to get talking. Communication, honest and open is the cornerstone of this movement. Transcending silos, echochambers and filterbubbles is no easy task, as almost every single election during the past two years has been mercilessly teaching us, therefore initiatives like PARLEM are useful so that we can see whether tech, social media, and familiar platforms can perhaps be used for bridging sociopolitical divides, and if not, then we should at least be learning why not and figuring out what else could be done to remedy social division that seems to be widely on the rise. 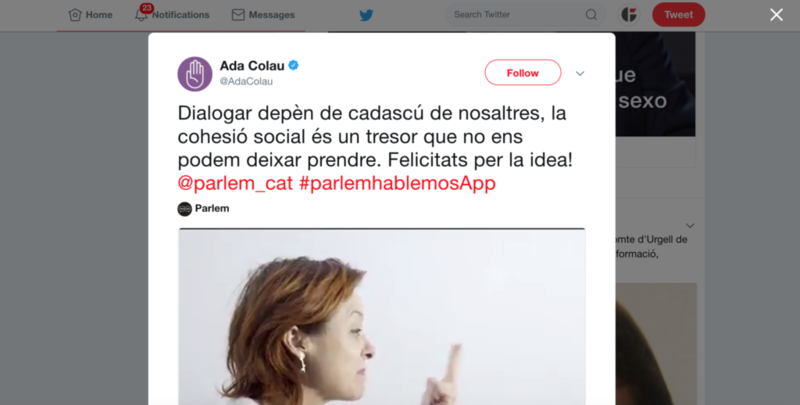 PARLEM is not associated with or financed by any political party and it is “the variety of ideas and diversity of people” that make up PARLEM that give Parlem_Cat its edge. So spread the word, get talking. We’re counting on you.